Last week was a little quiet around here because I was busy teaching! It was really fun to spend a week with some 5-8 year olds and make art. The title of the class I taught was called "What Do You See?" and I based the art we made around some of my favorite books. A few of these books overlap with our Children's Books That Inspire Creativity list and 25 Books About Art and Art History List. However all the books on this list really encourage kids to find inspiration in the world around them. Seeing that the sky, a circle, a leaf or even a mistake can become a work of art was what I was hoping these kids would take away from the class. By the end of the week I was delighted to hear kids reminding each other not to say "I messed up" but to instead say "I made a beautiful oops" It made me feel like they had really gotten something from the class and all these inspiring books. The lovely story of three children and their neighbor Stillwater, a Zen panda. A great book that teaches kids that sometimes making a mistake can be a good thing. A great story about all the things a square can become. The story of a little boy who learns that you don't have to do something perfectly to enjoy it. 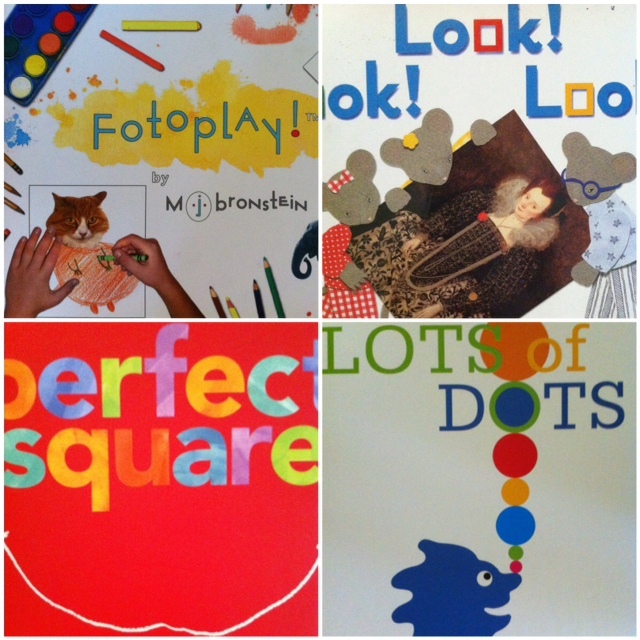 A beautiful interactive book that allows children to finish photos with their imagination. Teaches kids that art is a powerful form of communication and a great way to bring people together. uses bright, engaging illustrations to show kids all the possibilty of a single, simple circle. A fun book that encourages kids to look at things in a different way. Pezzatino is a small creature who is on a search for his missing piece. A autobiographical story of author illustrator Lois Ehlert about what how her parents inspired her to become an artist. A cute story about two lizards who's paintings get a little creative. A family of mice discover a postcard and spend some time really looking at the painting on the front.